A profile of Cention.se was found on the social network Facebook. The web server with the IP-address 83.140.11.2 used by Cention.se is run by Availo Networks AB and is located in Sweden. 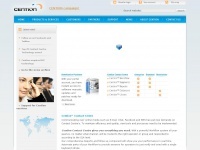 The website Cention.se has a own web server. The web server only runs this website.